1. Scoop out and discard the flesh and pips from the preserved lemon. Rinse in cold water to remove some of the saltiness, pat dry with kitchen paper and finely chop the peel. Mix with the crème fraîche and lemon juice. 2. Place a large pan over a medium heat and add the spinach. 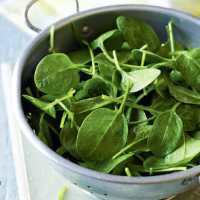 Remove as soon as the spinach has wilted, drain in a colander and refresh under cool running water. Gently squeeze out the water from the spinach using your hands. Dress with the olive oil, lemon zest, parmesan and chilli. Place on a serving plate and spoon the preserved lemon dressing over the top.